You’re a smart recruiter, which means that you have the intellectual horsepower to get, organize, analyze and disseminate information; deal with clients and to screen and assign candidates. But nowadays it also means that you have the emotional smarts to gauge the emotional and temperamental fit of applicants and candidates, i.e., you have the emotional intelligence to assess the emotional intelligence of others. “Emotional intelligence” has a nice ring to it. But, If there is any such thing as “emotional intelligence” (EI) or its associated “emotional quotient” (EQ), not only will it be very useful to know what it is, it will be important to know what it isn’t. Historically speaking, a relatively new and fuzzy concept, EI has been interpreted in a multitude of ways, not all of which deserve to exist. In part, as a backlash against a perceived elitist bias toward “book-learnin’” IQ and, in part, as a back-up for those excluded by that elite, “emotional intelligence” and “emotional quotient” have become mainstream concepts and tools, however roughly framed and used. In their exuberance to fashion and wield these concepts and tools, some EI proponents and commercial promoters have made mistakes that repeat those made in the early days of IQ testing and comparisons. As a result, the understanding and application of the new quotient on the block, EQ, has been flawed—plagued by some of the same errors identified and rectified since the comparably early era of IQ testing, e.g., the flaw of cultural bias and the mistake of failing to distinguish aptitude from achievement. Now consider this EI question: what is the emotionally intelligent response to the following situation? (a) Display your disapproval through non-physical anger? (b) Display your disappointment through sadness? (c) Calmly discuss with her your family hopes, policies and expectations, as well as your concerns about the suitability of the boy? (d) Allow her to make her own decisions and limit your involvement to offering advice when she seeks it? If you are as egalitarian as the American ideal, you probably chose (c) or (d), while gasping at (e). Extreme though this example is, it makes the cultural relativity of “emotional intelligence” transparently obvious—a fact that is incorporated into some definitions of emotional intelligence, and a consideration that immediately raises a red flag regarding the eligibility of “emotional intelligence” to join the ranks of recognized innate and universal intelligence measures. 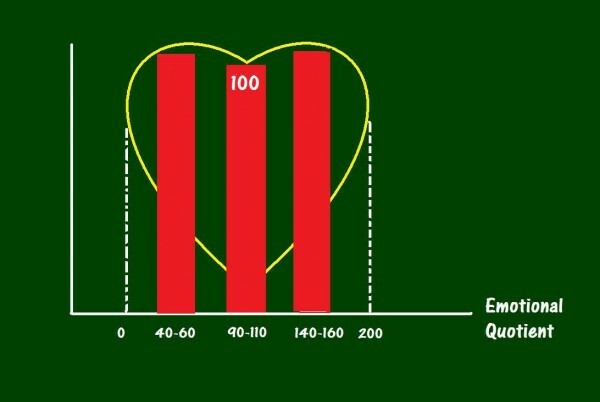 So before you congratulate or berate yourself for a low EI online score, e.g., on the emotional intelligence test at the popular Psychology Today website (http://psychologytoday.tests.psychtests.com/take_test.php?idRegTest=1310), take a closer look at the questions in any EQ test you’ve taken or seen. It will be nothing short of a miracle if there are none with a cultural, moral or ideological bias or some confusion of aptitude and achievement, the latter in the form of learned emotional skills, rather than innate ones. Despite our cherished egalitarian ideologies, the fact is that the right response may vary depending not only on the cultural situation, but on the relative rank of the participants: When outraged by an enlisted man’s namby-pamby attitude, General Patton was wrong to strike the weak-willed soldier, but a toned-down, yet nonetheless stern emotional response that would have been “emotionally intelligent” for Patton would have been, in virtue of the difference of rank between them, “stupid” for the enlisted man to dare attempt. Even dominant and deferential silverback gorillas grasp this difference in their jostling for rank in the troop hierarchy. Yet, somehow, perhaps under the influence of Western egalitarianism, some EI theorists have not, and have instead blithely assumed that the “correct” answer on an EI test is correct for all—irrespective of both culture and rank. To put these issues into a recruitment perspective, imagine you are interviewing a Thai job applicant. You are both comfortably seated and in crossing your legs, you happen to point one of your shoes toward him. Since you are probably completely unaware of any emotional consequences, namely, his culturally-instilled discomfort in having a shod foot pointing at him, you would fail to display insight into the emotional consequences of your behavior. Does this mean you have to subtract points from your EQ? Of course not. You have merely revealed a limitation of your emotional-cultural achievement, not of any innate emotional-cultural aptitude. It means you have something to learn, not an innate limitation to bear. But since this can be learned, why call this kind of learnable understanding “intelligence”? Why not call it “emotional skill”? Perhaps it is because skill requires extra work, whereas intelligence doesn’t—which is great for really busy people, like recruiters.